Dutch Queen Beatrix abdicating, son will be king…. The Netherlands’ Queen Beatrix announced Monday that she is ending her reign after 33 years and passing the crown to her eldest son, who has long been groomed to be king but who will have to work hard to match his mother’s popularity. 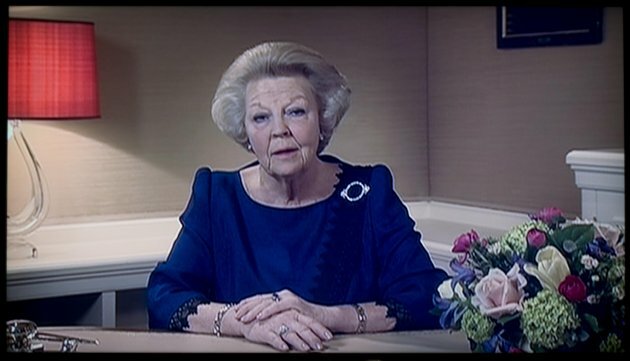 “Responsibility for our country must now lie in the hands of a new generation,” Beatrix, one of Europe’s longest-serving monarchs, said in the simple, televised speech announcing her abdication. The queen, who turns 75 in just a few days, said she will step down from the throne on April 30. That same day, her eldest son, Willem-Alexander, will be appointed king at an inauguration in Amsterdam. He will be the Netherlands’ first king since Willem III died in 1890. Willem-Alexander is a 45-year-old father of three young daughters, an International Olympic Committee member, a pilot and a water management expert. In 1974, six members of an Amityville, New York, family were killed by their youngest son, Butch DeFeo. The following year George and Kathy Lutz and their three children moved into the home, and soon, they claimed, they were supernaturally attacked by a demonic ghost or spirit. They collaborated with novelist Jay Anson, who embellished their tale, and the story was soon adapted into a screenplay for the hit film “The Amityville Horror.” Investigators, skeptical of their claims, were proven correct years later when DeFeo’s lawyer admitted that he and the Lutzes made up the whole thing, and all profited handsomely from the hoax. A farmer in southern Nepal mistook his son for a monkey trying to steal his crops and shot the 12-year-old dead, police said on Sunday. Chitra Bahadur Pulami had been climbing a tree to chase away macaques that had become a nuisance to the family but his father Gupta Bahadur, 55, spotted the boy and opened fire, wrongly believing him to be one of the animals. “The son died on the spot after Gupta Bahadur mistakenly thought there was a monkey in the tree and opened fire. Our preliminary investigation shows that the father was unaware that his son had gone to the maize field to chase the monkeys. The three species of monkey native to Nepal, the rhesus and Assamese macaque and the common langur, are considered sacred and farmers normally try to scare them away from their crops without injuring the animals. “I realised my mistake only when my son fell down and got stuck in one of the tree’s branches,” the farmer was quoted as telling police by the Nepali nagariknews.com website after the incident, on Friday.